Site-unspecific works are site-specific in that they require performance, installation, or playback in discrete locations. However, they are not intended for any discrete or particular locations. There are no ideal venues for the works, only the stipulation of certain material conditions. In February of 2014, I was invited to perform as part of an art opening at a small house gallery called Magic Pictures in South Philly. Rather than performing within the traditional performer-audience paradigm, I established a sonic threshold for the space. When the threshold is crossed, a split second of computer generated white noise sounds off. The threshold for Magic Pictures created an environmental composition based on the audience’s heightened sense of sound-making. It also influenced the audience’s movement and behavior in relation to the threshold dynamic. As a result, the social, visual, and acoustic wove together in reciprocal harmony. The noise was activated despite the application’s lack of cognizance vis-à-vis the subjectivities of that particular room’s particularities. The structure of the piece is quite simple yet its application in an array of different environments ensures diverse outcomes. The defining characteristics of any single environment have no bearing on the total set of possibilities. As a corollary to the unfolding composition, the site-unspecific nature of the work encourages a multitude of listener perspectives with each iteration. White noise is a versatile indicator for space. It is pure in concept – all frequencies at equal level – though when introduced to imperfect environments it is necessarily shaped in accordance with them. “Rauschen therefore is maximum density, maximum information. But it is also the opposite: no information, maximum redundancy,”1 Peter Ablinger writes. Working with white noise is a way for me to explore the negative side of space. If every environment is primed for affectation, I seek to invert the valence. No information, maximum redundancy. What is this encounter like? I find myself increasingly exploring discursive situations as a way to diffuse syntax into spaces. Akin to John Cage with Empty Words, I am interested in making language less understandable2. By expanding the frame and consigning control, the possibilities to confound are bolstered. People mis-comprehend things differently. I believe that dis-orienting perspective is an ethical way to frustrate the format at hand. 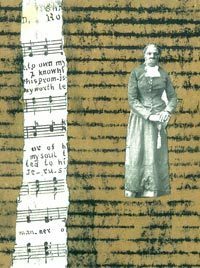 Because once a particular perspective is thought of as merely a formal technique, it will almost certainly obstruct the listener’s ability to engage with the material from her own critical perspective. 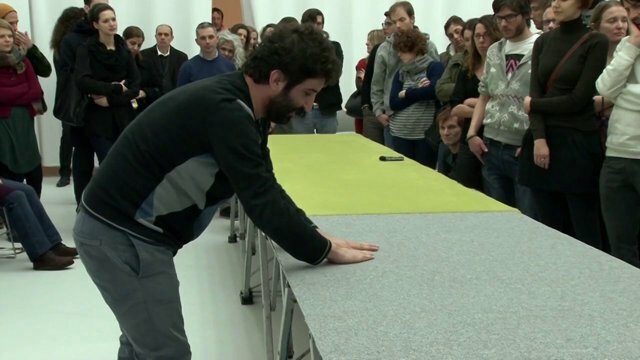 Cevdet Erek’s SSS – Sahil Sahnesi Sesi / Shore Scene Soundtrack (2007) connects sound to its material source by instructing the performer to rub their hands on a piece of carpet. This activity can be done almost anywhere, in the gallery or on the beach, where the sound emitted from the carpet blends together with the ebb and flow of the ocean. Peter Ablinger’s Chair Projects (1995-2007) is a series of pieces composed of different chair placements. 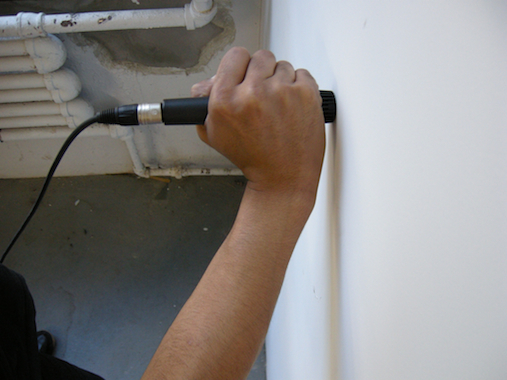 Kabir Carter’s Report (2010) establishes a room’s acoustic character through the impact of microphone against architecture. This passage highlights something problematic for the artist working with sound. Unlike static objects or more narrative-based works, sound is unable to be produced or re-produced without molding to reflect on the physical characteristics of its real site. This has always been true for music, which on the traditional end of the spectrum necessitates formal venues for its reception. And it is also true for work in which site is intrinsic to its composition. In regards to the site-unspecific, I am elaborating on site-specificity by deliberately not idealizing any discrete or particular location. Any potential site is suitable, with all of its social, visual, and acoustic flavor, as long as certain material conditions are in place (e. g., access to electricity). 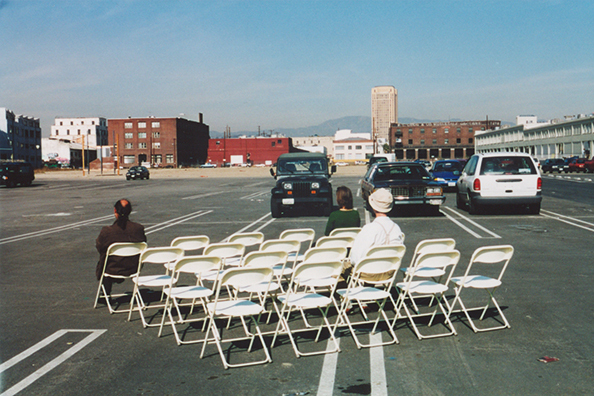 Ironically, the pioneering site-specific work of Max Neuhaus offers an instructive point of departure. 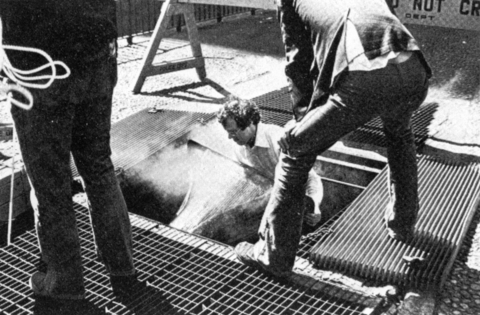 Though Neuhaus’ sound installations are fixed in physical space, pieces such as Times Square (1977) and Time Piece Graz (2003) internalize the sound’s relationship to its site. As with site-unspecific work, Neuhaus’ site-specific installations are shaped by the material indeterminacies of their diverse listening environments. The sound is in space yet makes no claims to it. Perspective isn’t a formal consideration. Neuhaus’ installations remind us that sound’s spatial presence is unavoidable, that the sound is indifferent to bad acoustics or even a listening public. Crucially, we are reminded that acoustic space is the same as space in general. Bennett Williamson hosts a chat with Eric Laska, on the occasion of the simultaneous Los Angeles premiere of Acting On Impulse, 2013. Acting On Impulse is a series of site-unspecific performances I’ve been staging since early 2013. In the work, white noise is generated from a computer and switched on and off for differing lengths of time by a human performer. It has been staged in combination with an artist talk, electro-acoustic improvisation set, and sound poetry performance. As a counterpoint, with the 2011 application Impulse Blasts, white noise is generated from a computer and switched on and off for differing lengths of time by tweakable Gaussian variables. In both instances, the playback control is relegated to an independent, autonomous apparatus. Impulse Blasts employs an algorithm, Acting On Impulse a human being. Acting On Impulse, performance by Richard Kamerman and Billy Gomberg, Brooklyn, 2013. The focus on the playback mechanism contributes to the work’s multi-dimensional approach to multi-dimensional space. As with Threshold, the social, visual, and acoustic merge together per the dissolution of control. I allow for the composition to unfold within its environment. In this sense, the site-unspecific application provides a concise vehicle with which to expunge my own perspective, and that of dubiously presumed neutral formats, from the work. Gordon Faylor tells me, “[the application’s] inertness means the room has to play.” It also means I have to listen. 1 Ablinger, P., “Rauschen,” http://ablinger.mur.at/rauschen.html. 2 “John Cage on Empty Words and the demilitarization of language, in a radio interview, August 8, 1974,” http://www.writing.upenn.edu/~afilreis/88v/cage-radio.html. 3 Kwon, M., «One Place after Another: Site-Specific Art and Locational Identity», Cambridge, The MIT Press, 2004, page 29. 4 Cage, J., «Experimental Music» (1957), in Silence. Lectures and Writings, Middletown, Wesleyan University Press, 1961, pages 7-8. Eric Laska (b. 1986) is an artist currently based in Philadelphia. He is founding editor of the website Lateral Addition.